While writing about the hyper-addictive appeal of Korean television dramas, known as K-dramas, I was seduced by dramatic images of Jeju-do, a volcanic island located off South Korea’s southern coast. So, when I recently traveled to Seoul for business I also booked a trip-within-a trip, a long weekend on the rocky island, which has since become one of my favorite places on the planet. Jeju-do is a popular honeymoon destination among South Koreans and also a magnet for Chinese, Filipino, and Japanese K-drama fans because so many dramas are filmed there. My desire to visit began with a specific drama, Warm and Cozy, which told the story of an island restaurateur. The drama’s scenery included cratered mountains and stunning lava cliffs, brightened by a profusion of tangerine-laden trees and fields of sunny rapeseed flowers. It also focused on the matriarchal culture of the island’s women divers, known as the haenyeo. You don’t have to be a k-drama fan to love the island’s spectacular scenery and its freshly harvested seafood cuisine. Walking the island’s trails and beaches makes it a worthwhile experience for any adventurous traveler. My trip-within-a trip was not only a treat, but convinced me to double up on any future travel destination. Taking a trip-within-a-trip is an easy way to make the most of your travel dollars. Whether you travel for business or pleasure or live abroad for a while, adding a trip within a trip can layer on more pleasurable experiences. Next time you plan a trip, don’t just settle for one destination. Use a protractor and make a circle, then do some research to determine where and how to augment your visit. Flights to Jeju Island are short, slightly more than an hour from South Korea’s Gimpo Airport, which is easily accessible from anywhere in Seoul by train and bus. Getting to Jeju is simple. But you also have to plan how you will get around the island, as getting to the best locations requires wheels. Tour buses will take you to popular tourist sites and average about $70 a day. But tour buses make it difficult to travel at your own pace and explore attractions off the beaten path. Renting a car or hiring a taxi/guide lets you pursue your own interests. Driving on Jeju is not intimidating, as the roads signs are mostly marked in English. To rent a car, you will need an international driver’s license. Getting one, involves a visit to an AAA branch. You’ll need to fill out an application, bring two original passport pictures, a valid US. driver’s permit, and $15. Or, you could hire a taxi driver/personal travel guide. On short visits a guide can make sightseeing more pleasureable as they can calculate the most efficient way to cover multiple sites. Guides cost between 100 and 150 Won ($87 to $130) a day. They provide the vehicle and many speak English. Just list the sites you want to visit and the guide will tailor the trip to your interests. Guides also know great places to eat that are not swamped with tourists. Be sure to discuss prices and the schedule up front. Udo island, a smaller island off the island of Jeju, is reached by ferry. Cars can be taken on the boat, or you can park and rent a bike, motorbike or mini-car once you get to the island. Tiny Udo has some stunning views and touring it on bike makes for a great day outing. 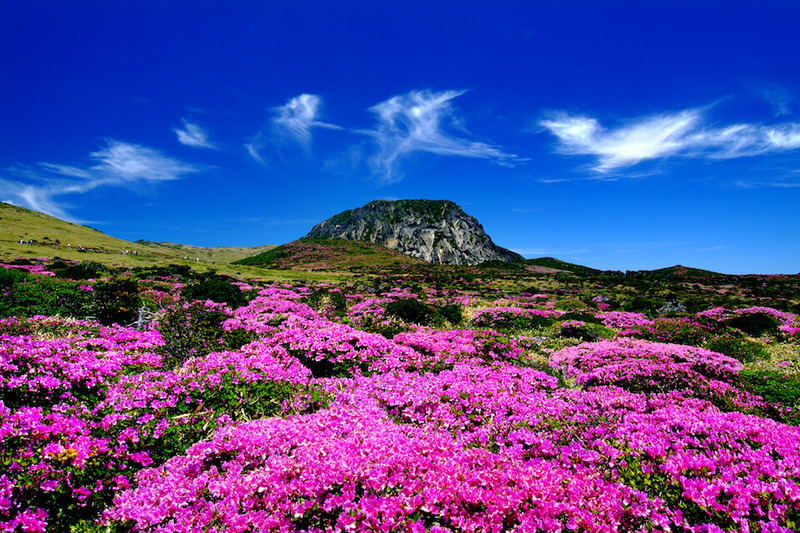 Impressive Hallasan Mountain sits in the middle of the island dividing it neatly into Jeju City and Seogwipo. While it might be tempting to book a hotel near the Jeju City airport, most of the attractions are located in the south of the island in the more resort-like area known as Seogwipo. Driving from the airport to the south takes about an hour, but if you plan to spend most of your time there, that’s worth it. 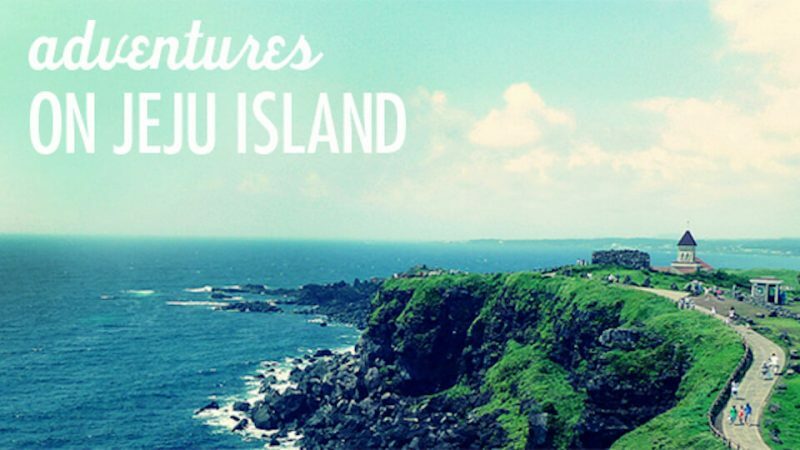 There is no shortage of things to see and do on Jeju Island. Take your time, it’s better to see a few things that really matter to you and enjoy the time you have rather than to rush through a long list and not really “see” anything. 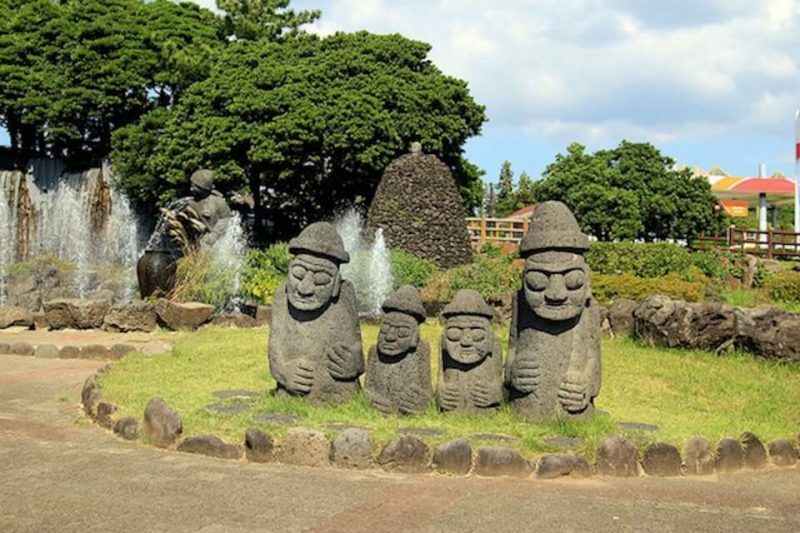 Jeju Stone Park is both a museum and an ecological park, that celebrates the island’s geology and the prominent place stones hold in the island’s culture. The museum exhibits time-worn stones as art; fluid stone sculptures carved by volcanic upheaval and centuries of weathering, as well as filigreed tree fragments frozen by lava. The park features Stone Age villages, with circular huts made of stone; piles of ritual shamanistic stones, and rows of giant stone “grandfather” statues lining outdoor walkways. Visitors can explore the park’s various paths, bordered by various stone artifacts. The museum itself is settled into the landscape so it fits unobtrusively into the geological footprint of the park. Before visiting this park, stones did not strike me as a particularly exciting exhibit, but the stone museum changed my mind. Also known as Sunrise Peak, this mountain takes about an hour to climb and offers expansive ocean views. Start climbing when the dawn sky starts to brighten and you will reach the top in time to watch the sun rise over the shimmering sea. Climbing the mountain at sunrise is considered a romantic activity among Korean couples who visit the site. Because the romantic sunrise climb was featured in a Korean drama, this cone-shaped mountain has become a popular tourist location. Visiting the mountain early has another advantage, as it can help you avoid the busloads of Chinese drama tourists that tend to come later in the day. Also, it’s best to visit on a weekday rather than a weekend. Jeju is famous for three things, the wind, the water, and the diving women known as the haenyeo. 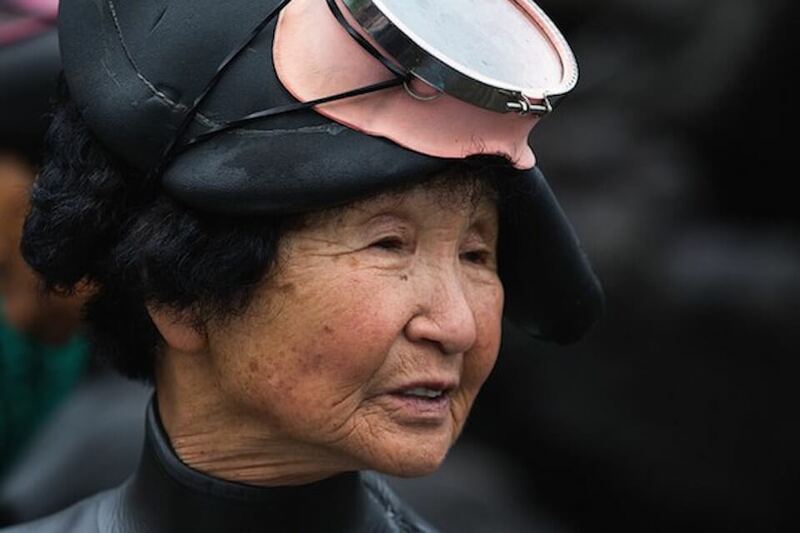 For countless centuries the women of Jeju have risked their lives, diving into the ocean without sophisticated breathing equipment. The haenyeo supported their families by diving for abalone, sea conches, octopuses, and seaweed. Most of the island’s haenyeo are now older than 50, as younger women have less dangerous options for making a living. But some of the haenyeo, who continue to dive, offer demonstrations of their skills at the foot of Seongsan Mountain. If you are interested in the history of the haenyeo, there’s a Haenyeo Museum, which offers background information about the history of these fearless divers. If you want to sample some of their catch, the haenyeo that continue to dive, often sell freshly caught seafood and seaweed alongside roads near the beaches on Jeju and Udo Island. Hallasan Mountain is the highest mountain in South Korea, 45 by 25 miles across and 6,400 feet high. With a peak that is often covered in clouds, it is known as the “mountain high enough to pull the galaxy.” It’s an exceptionally beautiful place to hike and walk. Many visitors are surprised to discover that the mountain is actually a shield volcano and technically still active. The cratered top is crowned with ponds. Hallasan National Park features 368 parasitic volcanoes, cone-shaped accumulations of volcanic material. Trails criss-cross the mountain, taking from two to five-hours to hike, and the park is also the home of Gwaneumsa, the oldest Buddhist temple on the island. Manjanggul Lava Tube is an underground lava cave located in Gujwa-eup. Visitors to the cave are often impressed by the scale of the tunnel and its unusual lava formations. The tunnel reaches 98 feet tall at its highest point and runs three miles long. Traces of the ancient lava flows, well-lit lava stalactites, columns, and unusual formations create otherworldly views. The tiny island is located off the east coast of Jeju and you must take a ferry to get there. Once there you can rent a mini car, bikes or motorbike. Udo is a great island to bike around. You can sample the fresh seafood caught by the haenyeo, visit stone tombs, enjoy cruises and relax on white sand before a surprisingly emerald sea. The office-appropriate attire I packed for Seoul business meetings was not suitable for hiking, so, I really packed for two trips. On the flight to Korea I packed all my clothes together and used a backpack to transport my laptop, papers and personal items. When preparing to go to Jeju, I emptied the backpack and packed enough for a weekend, leaving my larger luggage behind. Since I was there for only three days, I packed only two changes of clothing. Camera, toiletries, and clothing fit into the backpack. On Jeju I unpacked and used the bag as a daypack to carry my camera and other essentials while hiking and visiting sites. Here’s more of what you may need specifically on Jeju, and in general for Korea. Jeju is glorious when it’s sunny but it also rains a lot. Some of the best places to visit are outdoors and could be muddy or have uneven ground. Don’t attempt the Manjanggul cave without waterproof shoes. Particularly deodorant. It’s hard to find deodorant in Korea. Almost all Koreans lack theABCC11 gene responsible for producing underarm odor. If you’re not so lucky, you may want to bring your own. Some South Korean flavors may not appeal. Adventurous travelers can try pine salt toothpaste or bamboo flavored toothpaste. While there are enough ATMs in Seoul, running out of cash on Jeju Island may pose a problem. You can use your credit card to buy everything from coffee to soju to meals, but if you need cash, many ATMs, also known as Auto Banks, only deal in domestic transactions. One tip is to visit the most luxurious hotel around, one that caters to foreigners, as they may have an ATM that deals in international transactions. Even though the adapter packaging says it works in Asia, it may not work for your laptop or phone charger. The adapter purchased for my phone did not work but I was able to plug it into my Mac Air laptop, which did have an Apple adapter. Adding global service to your bill does not necessarily mean your phone will work in places where there is no wifi. Korea has plenty of free wifi but it’s tricky making calls when not in range. Another option is to buy a cheap phone at the airport and use it for the duration of your stay. You can reserve a phone before your Korean trip here. You can download the KTO’s Visit Korea app for your phone. The English pages can help you get from place to place, know when museums and other attractions are open. Jeju Island has killer views, beautiful hiking trails, stunning beaches, and some very tasty fresh-caught seafood. The island offers an satisfying trip-within-a-trip while visiting China, Japan, or South Korea. Final Tips: Go in spring, as this may be the most visually appealing time to visit as the island is covered in flowers, sprigs of multicolored azalea bloom from the craggiest lava cliffs. Don’t leave without trying the island’s famous abalone soup.